“If the Earth is rotating, why when we throw a rock upward, it would fall to the original location?” The explanation is that the rock maintains the momentum before it is thrown. Before it is thrown, the rock has the same velocity as the surface of the Earth, it does not suddenly lose its momentum after being thrown, and there’s nothing exerting a force to alter its trajectory. We usually use the moving vehicle analogy to illustrate this. If we throw the rock upward inside a moving vehicle, it would also fall to the original location, despite the fact that the vehicle is moving. Flat-Earthers reject the analogy. Their usual excuse is that the atmosphere is not separated from space, and the rock is thrown “inside” the vehicle, separated by the body of the vehicle from the outside. They offer the analogy of being on the top of a moving vehicle as the correct analogy. They are wrong. Kettle logic is making multiple contradicting arguments in an attempt to support a single point or idea. 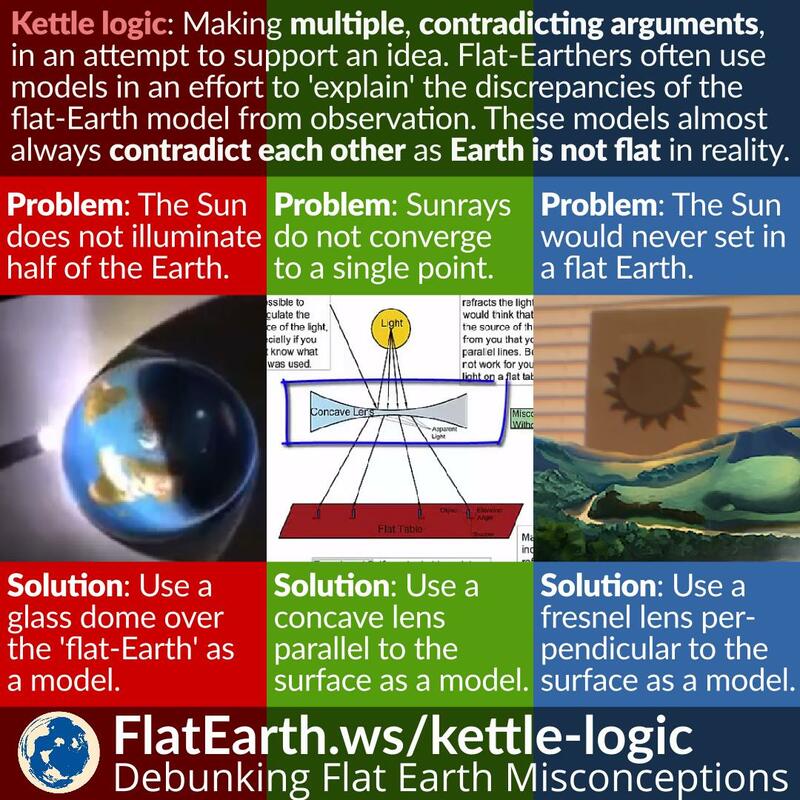 Kettle logic occurs very frequently in the flat-Earth community. If they meet a natural phenomenon cannot readily be explained using the flat-Earth model, they would often devise ‘experimental models’ to ‘explain’ how the said phenomenon can happen in a flat-Earth. The problem? These models are in conflict with each other. Gravity is the attraction between objects with mass. The attraction is greater if the objects are more massive. The shape of the object practically doesn’t affect the magnitude of the attraction provided the objects are spaced far enough. Humans have cognitive biases that can affect our judgments. One of these cognitive biases is the confirmation bias. Because of the confirmation bias, we tend to seek the information confirming our preexisting beliefs. Confirmation bias is a fact of life, and all humans have it. Confirmation bias can result in different subjective opinion from a different subject. 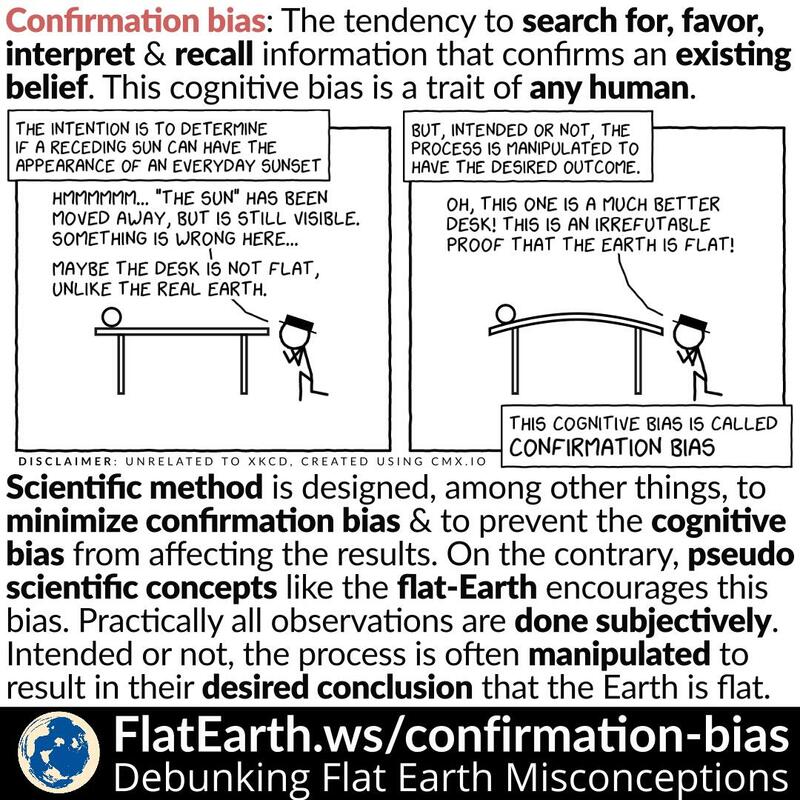 A characteristic of any pseudoscience —like the concept of flat-Earth— is that they don’t try to minimize the confirmation bias, but they actually encourage it. 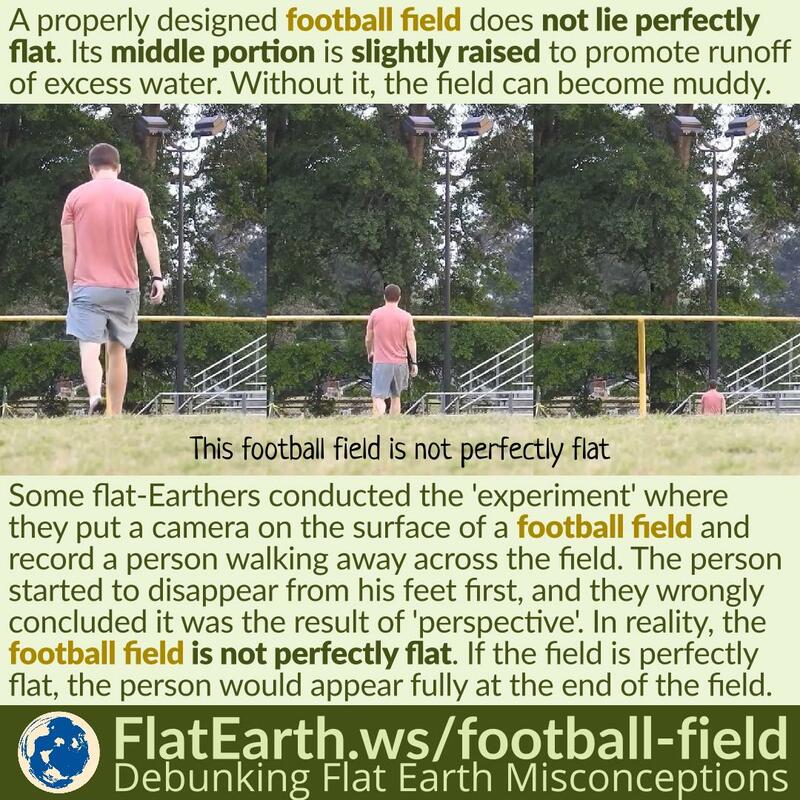 Ever seen a video where a flat-Earther tries to demonstrate that a distant object that appears to be behind an obstacle can be brought back into view simply by zooming in? He would then conclude the same thing would happen when zooming in to a distant ship, and the reason a distant ship is not visible is not the curvature of the Earth. Well, no. The real reason why the object in that experiment can be seen after zooming in is that the obstacle is close, and there’s difference in the camera’s entrance pupil size when the zoom changes. For a camera that has very long zoom range —like the Nikon P900—, the difference can be very dramatic. The mass of the Earth exerts the gravitational acceleration of about 9.79 m/s² to everything on Earth’s surface toward the center of the Earth. On the other hand, the rotational motion of the Earth generates the centrifugal acceleration of about 0.03 m/s² away from the Earth. The net acceleration is about 9.79 m/s² toward the center of the Earth. That is why everything on Earth’s surface stays on the surface, not flying away to space. Flat-Earthers often make a false comparison using a wet spinning ball. Water on the surface of a wet spinning ball does not stick to the ball; but the Earth is also round, wet and spins, yet everything stays on the surface. Then they make the erroneous conclusion that the Earth cannot be a spinning ball.